The goal of creating social media messages is not only to reach your audience, but also to achieve an intended effect. Proper grammar and punctuation are important in social media writing, as is accuracy. A careless error could undermine the credibility of your brand. Here are a few other factors to consider when creating social media messages. More than many forms of communication, social media messages need to motivate the audience to engage with the content. Several strategies can encourage engagement, such as responding quickly to feedback from audience members, creating contests, and inviting the audience to respond to a question. Including photos and videos in social media posts substantially increases engagement, as does integrating trending topics (Redsicker, 2014). This requires careful consideration and research that will pay off if the trending hashtags are chosen wisely. 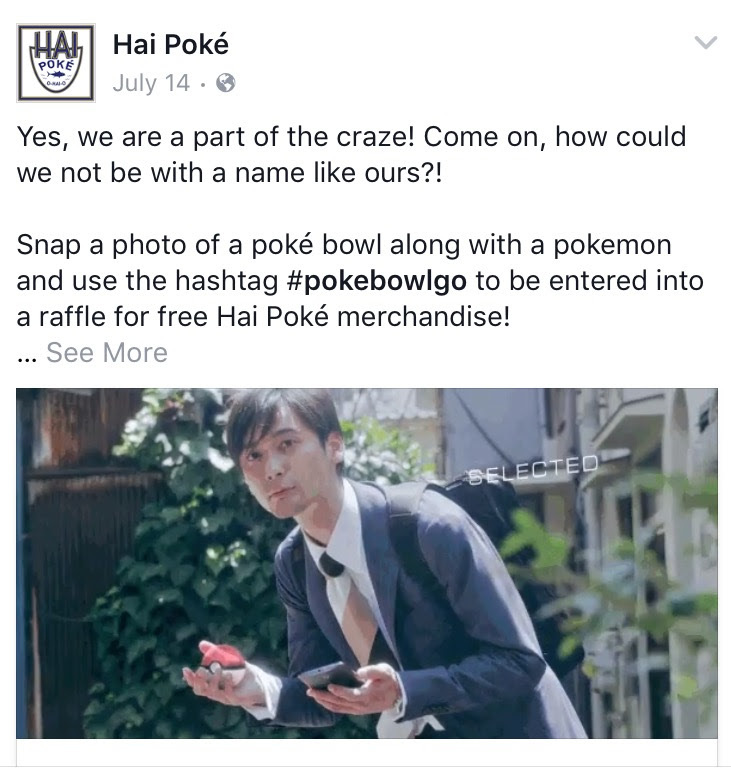 Hai Poke, a startup restaurant in Columbus, did this by tapping into the Pokemon Go craze in the summer of 2016. The restaurant launched a social media contest and created a fun, timely, interactive message. “Poké” social media campaign image from Hai Poké’s Facebook page. The core message needs to be articulated across all social media platforms in a consistent way that conveys a unified voice. The message also needs to reflect the brand image; in other words, it should reinforce the brand “feel” or personality. Referring back to the IHOP Twitter controversy, one reason audiences disliked the message was because its suggestive tone was inconsistent with the company’s family-friendly brand personality. Similar to news writing, social media writing is straightforward. Because you’re competing against countless other messages in the social media sphere, you do not have much time and space to capture the audience’s attention. This is especially the case with Twitter, with its current 140-character limit. You have to think carefully not only about what the message will say but how to say it in a concise manner that has the intended effect. For more information on effective social media writing, take a look at this video with Nicholas Love, social media director at The Ohio State University.